Do you ever feel like you’re swimming upstream? Or that you have big goals but your income doesn’t match? 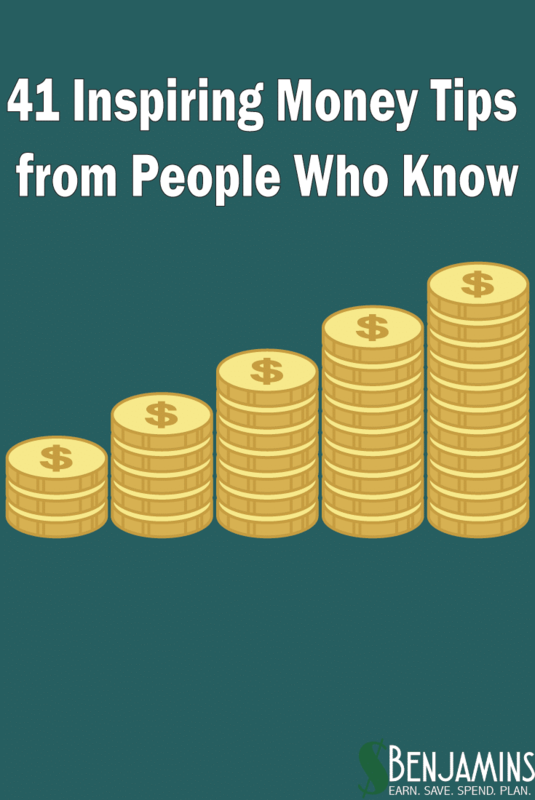 So I asked 41 personal finance experts if they had any inspiring money tips. And boy, did they ever deliver. Scroll down, get inspired, and bookmark this page in case you need it one day. “Start with the big picture: what is important to you, what you value, how you want to spend your time. Then you can use that as a jumping-off point to help guide you toward your savings goals. “To create a separate savings account for all hustle and *extra* money that comes in. I’ve been doing this for 6 months straight and already have $3,500 in it now which is more than motivating!! And pretty much anything else random that comes my way I wasn’t expecting, or need, to live off. It’s been an eye opener to say the least! “One of my favorite quotes is, “The best time to plant a tree was 20 years ago. The second best time is today”. It’s an ancient Chinese proverb that really highlights the value of time – which is so important when it comes to money. It will change your life, in a tiny little positive way. Tomorrow, or later today, do a tiny little positive thing. Send a pitch email, update your LinkedIn profile, check the odd-jobs board on Craigslist, delay going to the grocery store by one more day, finish a high recognition project at work, or take $5 out of your wallet and put it into savings somewhere, like at the bottom of your change jar. Maybe hide it in an out of season jacket or blazer, so that future you has a good day. Maybe use it to open a savings account for your kid. “In life there are problems you solve and there are problems you manage. Money is a problem that you manage. Confusing “manage” with “solve” will leave you forever frustrated. But realizing that money is a part of life that needs continuous management eliminates the pressure of “solving” it once and for all. “I like it when money advice is framed positively instead of negatively. Consequently, among my favorite tips is to spend your money freely on things you receive a lot of value from, but ruthlessly hack your expenses elsewhere. “Focus on extreme events, not average expected outcomes. On average your hard drive won’t crash, yet you back it up. On average you won’t die in the prime of your life, yet you have life insurance. “1. Never borrow against a depreciating asset. Don’t take out a car loan, or pay for electronic goods with a credit card if you can’t pay off the balance immediately. One of the most important things I’ve ever done is value my time – literally and figuratively. I actually started to calculate what my time was worth. From that point on, I made a lot of decisions based on the financial cost plus my time cost. The result of valuing your time? You get more money. The way you get more money is you stop wasting your time and effort on things that don’t matter or things you don’t want to do, and instead can focus on things that do! As an example, I stopped doing chores (lawn work, ironing) and outsourced those things so I could learn how to invest. “Money CAN actually buy happiness…if you figure out what happiness is for you. Is it more time with family, more vacations, more memories, or more things? Thanks for including my tip! Definitely an awesome list for people to check out. Great article with a ton of wisdom! This one’s a keeper! Great list. I had already read many of them before seeing this list, and they are all informative. Thanks! You know the old saying….it isn’t what you know, but what you do. That’s what I love. Great strategies are usually the ones right in front of you.